Hire this high-quality children’s birthday party magician! Amazing Magician Captain Kid is an Alaska native and Scottish mix. He joined the Army after high school and became a Green Beret. Growing up in rural Alaska, KC’s early life was spent in an area remote by any standards. KC was not always a birthday party magician, he has done a variety of work in Alaska, from commercial fishing and mountain logging to publishing. He spent 10 years in Fairbanks, AK where he went to college, got into computers, and started performing kids magic – first as a volunteer, and later professionally. Most of all, he loves performing for kids, and they love him! another magician captivated the children of all ages while he was volunteering to help kids at a camp. This is what led this children’s birthday party magician in Raleigh to eventually perform magic professionally. Soon you will see his show – and love it. was not a good place to learn magic, because there were no magic clubs or mentors. Most of the population never considered a birthday party magician. Everything Captain Kid learned about birthday ideas, was from books. He ended up being self-taught, and because of this he was quite different from other magicians in the “Lower 48”. To this day he avoids seeing other magicians in order to maintain his individuality. This children’s birthday party magician found that being a children’s entertainer in Fairbanks was slim pickings. He could not afford expensive magic props that do the magic for you, so he developed on his own what is now called “Organic Magic” for birthday party shows. There are no strange looking props with this magic, but instead, props to which everyone can relate– silverware, real cups, dishes, white board, paper bags, pencils, cans, and money, etc. Children’s birthday party magician Captain Kid found these to be more effective than the strange-looking props other magicians were using. The magic feels more real, and consequently, is more believable. Captain Kid’s persona in his personality-driven comedy magic show has much to do with organic magic. He is a wonderful birthday idea! After thirty years and thousands of children’s magic shows from Alaska to Florida, The wonderful Captain Kid has perfected the children’s birthday party experience. 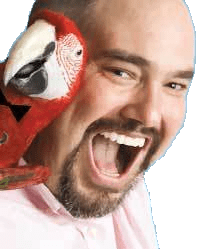 Captain Kid also performs magic for corporate and college clients (as KC Cameron) in mostly the Raleigh, NC area doing stage magic and close-up magic for adults with his exuberant parrot Jax. – Here is a birthday idea, hire Captain Kid! Captain Kid performs his Children’s Magic shows in Raleigh NC, Durham NC, Cary NC, Wake Forest NC, Claton NC, Garner NC and Fayetteville NC and will travel to other locations!